The Nineteenth Population Health Colloquium conference content is now available in a variety of formats. You may purchase the Summit streaming content in the following formats: Flash Drive or online archive (6 months). 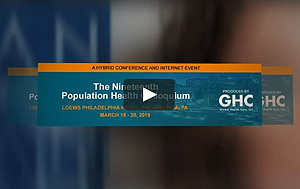 Online Archive of the Nineteenth Population Health Colloquium Presentations! Flash Drive of the Nineteenth Population Health Colloquium Presentations! Learn more about the 2019 Hearst Health Prize Finalists. See the finalists at the poster session on March 18. The winner will be announced on March 19. Click here to download the conference app to your mobile device. Accounting Professionals: Approved for up to 15.5 NASBA CPE credits. The Population Health Colloquium is now offering a limited number of partial and full Tuition Scholarships to qualifying representatives of local, state and federal government, consumer advocate organizations, safety net providers, academics, students and health services research organizations.